Softer Side of America's "Pivot"
By expanding military-to-military contacts and joint training, America is using a softer application of its hard power to good effect. The U.S.’ pivot to Asia has generally been portrayed in terms of the additional military assets that Washington is sending over to the region: Marines to Australia, littoral combat ships to Singapore, MV-22 Ospreys to Japan, and additional U.S. Navy ships to the Pacific overall . However, the US military’s increasing diplomatic efforts are at least as important. Most Asian militaries are in the process of modernizing, and many are starting from quite a low base. So while these countries may not regard themselves as being especially on the U.S.’s “side”, and while they may not be in a position to acquire much expensive American weaponry, they are only too happy to pick up some operational tips from the experts. Washington is using this softer application of its hard power to good effect. For example, recently the U.S. Navy has been conducting exercises with the Cambodian Navy as part of its CARAT series of regional drills, having held another CARAT exercise with Bangladesh only last month. The U.S. military’s Pacific Commander held talks with the Bangladeshi prime minister soon afterwards. These two countries are generally regarded as being pro-China, and are hardly core interests for Washington. But the U.S. military, through positive engagement, is quietly expanding its strategic influence in places that might not always have been so open to American input. Two even more surprising military-to-military initiatives have been announced recently. First is the U.S.’s decision to invite China to take part in the next round of RIMPAC exercises in 2014. 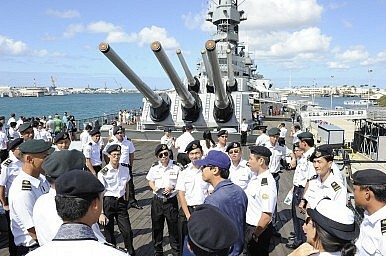 With China reportedly offended at having been left out of this year’s RIMPAC, despite the participation of most other Pacific navies, the U.S. military has, albeit belatedly, handed the Chinese an invitation to its biggest naval party. These contacts really matter. With China shuffling its pack of military leaders even as we speak, the next few months could set the tone for the next few years of Sino-U.S. military-to-military relations. Goodwill gestures and improved contacts should ease the tensions that have begun to build between the two Pacific powers, or at the very least ensure that things stay at their current, manageable level. Still more surprising was the U.S.’s decision to invite Burma to send military observers to the upcoming Cobra Gold 2013 exercise in Thailand. This is a step too far, too soon, some critics have warned, pointing out that the Burmese military continues to wage war in Kachin State, with continuing losses of civilian life. Nonetheless, the argument in favour of inviting some Burmese officers to Cobra Gold makes sense: these men need to be given a taste of what it is like to be accepted members of the international community, and to see for themselves the benefits of these multilateral training frameworks. With that achieved, further rewards – full participation in Cobra Gold and CARAT exercises, plus other bilateral training opportunities – can be made conditional on continuing political reforms, and most importantly on a ceasefire in Kachin. If the U.S. really intends to sustain its power in the Asia-Pacific into the latter part of the current century, it needs to be the region’s main force for stability. But more than that, it needs to be a non-threatening power that is a willing partner in the realization of local aspirations, be that military or otherwise. By expanding its military-to-military contacts and training frameworks, the U.S. is making a good case for seeing its military forces in Asia as a help, not a hindrance.